This is a topic where some people will have an opinion (and express it), without serious consideration of the subject. Reaching back centuries into the dusty corridors of my memory... Was it a Dennis the Menace cartoon drawing? Anyway, someone is asking the pastor after a church service, "But what if he punches you in the nose?" Or something like that. Good question. I have to admit that I was reluctant to use this verse because it is so horribly misused by believers and unbelievers alike. It has been ripped out of its textual, historical and cultural contexts and used to mean that Christians should simply be doormats. Although bad, We are commanded to love our enemies, pray for them, our kingdom is not of this world, there just words, God has abandoned our nation, this shouldn't be surprising! Satan isn't going to fight against his false religions, Jesus said, "The World will hate you because it first hated me" We stand for the truth, but not with hatred. We pray for them and are kind to them, it's like heaping hot coals on there head by not returning evil for evil. Not surprising at all. I took him to task for praying and not taking action about the topic in question. How can we be salt and light (Matt. 5.13-16) if we do nothing? Fortunately, some people have a grasp of the bigger picture. First, the most direct textual context is that Jesus was talking about being slow to retaliate. Look at the context and you will see that he was talking about interpersonal dealings and doing good for those who misuse you. Next, the cultural context. Did you notice he specifies the right cheek? The natural assumption is that two people are facing each other in an argument. Walter Wink points out that a slap on the right cheek had to be done with the left (unclean) hand. A backhanded slap was done to punish, or to humiliate inferiors. By turning the other cheek "robs the oppressor of the power to humiliate". If he resorted to using his fist, the recipient is no longer an inferior, but has become an equal. The whole point is to stop the insults and violence from rapidly escalating. Jesus did not answer the question of Dennis (above): "What if he punches you in the nose?" Hopefully, the principle would apply and the Holy Spirit would guide the believer so that he was slow in his response, and not just reacting out of rage. But nowhere does Jesus advocate standing there and being beaten bloody. Remember, Jesus is the one who made a whip and drove the money changers out of the temple (John 2.14-16). I am not using this as an excuse for myself or anyone else for simply becoming consumed with rage, because that leads to sin (Eph. 4.26). If a woman is screaming for help in the parking lot of the apartment complex, I most certainly would not say, "I'll pray for you!" No, I would not only call the police, but my nature (and probably the Holy Spirit) would probably have me take direct, physical action if necessary. I have said before that prayer is important, vitally so, but we must do our part as well. There are times when we must take a stand for what is right, even if it means violence. Otherwise, the weak and helpless are victimized while we stand by with our misunderstanding of a verse or two of Scripture. Addendum: A similar application is with the Answers in Genesis lawsuit against religious discrimination in the state of Kentucky. See "Should AiG “Turn the Other Cheek” Concerning Its Lawsuit?" Turning the other cheek...easier said than done a lot of the time. Just checking back to read any postings you may have done. It would be easier to be a LaVey Satanist, because they believe in striking back right now, no turning of cheeks at all. Actually, you did leave your "invitation" before. You must have missed where I declined the offer to follow your Weblog or to promote it because you teach baptism as a requirement for salvation. My response to that is here. 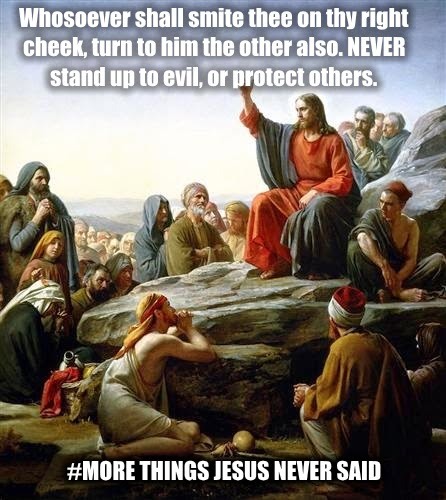 Jesus was not always silent as some portray Him. Sometimes He turned tables over, sometimes He name-called, and sometimes He was sarcastic. In the passage above, He was not nicey-nice. We also read of times where the disciples were to "go" with weapons and I don't think it was for the annual knife-throwing contest at the local pub. For that matter, the apostle Paul was not always Mr. Sweetness, either! And I really like Peter too; he's hand with a Sword, even if his timing was a little off.